Morton slumped to their first defeat of the campaign – just hours after the controversial departure of manager Ray McKinnon to Falkirk. The club, chairman and players were all angry at McKinnon’s exit, and the fans did not hide their feelings about the ex-Dundee United boss’ decision to leave for their Championship rivals. It took just three minutes for Morton to cut through Thistle’s backline. Denny Johnstone struggled to get the ball out of his feet and Cammy Bell denied the ex-St Johnstone loanee a chance to open the scoring from just six yards. With Morton starting the brighter, playing like a side with a fire in their bellies. Anderson and Sutton chopped and changed the formation throughout the opening period, as choice words were sung about former manager McKinnon by the travelling fans. Both sides struggled to create any chances until the 38th minute when Chris Erskine pounced on a loose ball but couldn’t dink former Thistle keeper Ryan Scully from 15 yards. Thistle ended the half just on top but started the second with a new sense of purpose, moving the ball at pace and giving the Morton defence problems. The approach paid off when Erskine fired a lovely half-volley beyond the helpess Scully for what proved to be the winner. 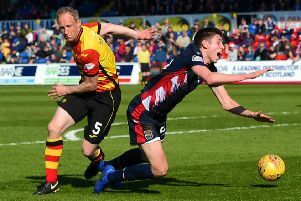 With the tricky Miles Storey pulling the strings Thistle continued to press and they thought they had doubled their lead when Kris Doolan fired in a spectacular shot only for ref Barry Cook and an assistant to controversially chalk it off. Morton struggled to put pressure on Thistle, creating only the odd chance, while Thistle looked more likely to increase their advantage though there was no further scoring. Alan Archibald expressed relief that the controversially disallowed goal did not prove costly, saying: “I’m only calm that we won the game and the decision didn’t cost us.